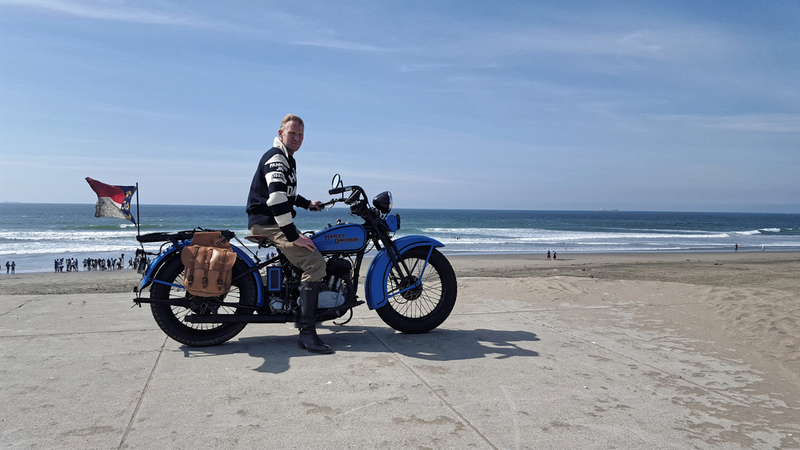 In complete disregard for the water shortage, I decided that before we rode the last 60 miles to the coast, my bike was going to be clean. After nearly 3 weeks on the road and it's tendency to sweat horsepower (i.e. leak oil) there was plenty of grime, bugs and debris that needed to be hosed off. 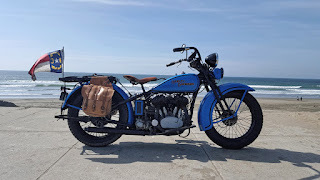 Once clean, I strapped my camera bag to the luggage rack, poured my last quart of Spectro 50wt oil into the tank and kicked started the bike for the last leg of the trip. The ride to San Francisco was relatively painless. 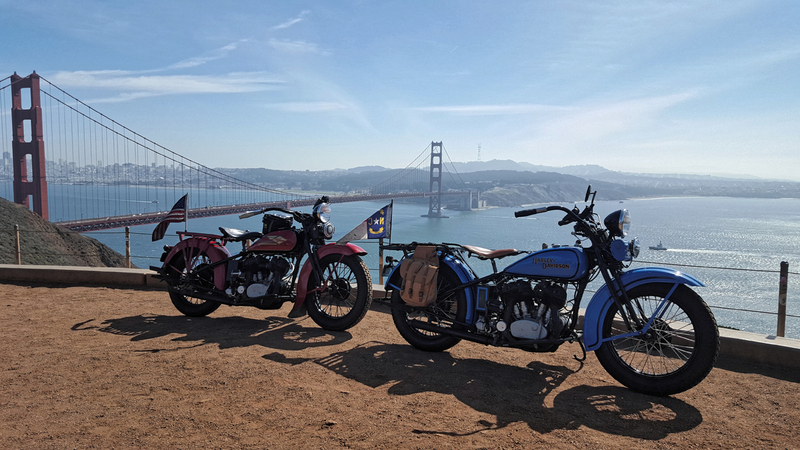 We headed out late morning, so we missed the morning commute traffic and rolled right up to an overlook across from the Golden Gate Bridge. Construction on the bridge actually started the same year my bike was built, but Harley was able to finish their build within the year, while the bridge didn't open for another four. After clearing off the tourists, we got down to the business of a proper photo shoot. 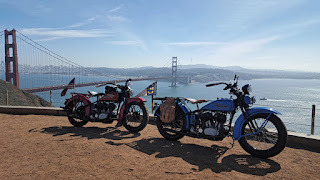 I'm sure there were some disgruntled folks who wanted to shoot selfies with the bridge, but after riding across the country I wasn't going to miss the opportunity to capture the end of our ride. Photos at the Golden Gate were nice, but we were doing a coast to coast ride and had to reach the beach to complete the trip. So we headed south down the Pacific Coast Highway and pulled off at a public beach access. 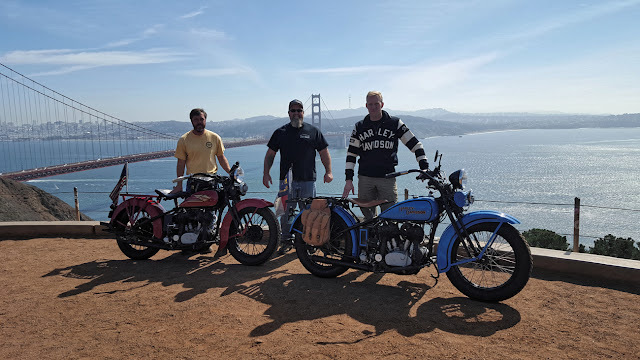 We took some more photos, but more importantly we gained bragging rights for a true coast to coast ride on 80+ year old motorcycles. We had some help making our way through San Francisco from another flathead rider whose sweet 40's bobber made me rethink having a modern engine with recirculating oil. After leaving the beach around 2:00, I figured it would be an easy ride back to Joe's house. Well I couldn't have been more wrong. As soon as we got into town, traffic was bumper to bumper. There was no way we were going to let our flatheads burn up in traffic, so with Joe in the lead on his Ultra, we started splitting lanes. For the uninitiated, lane splitting seems to border on insanity even with a new bike. 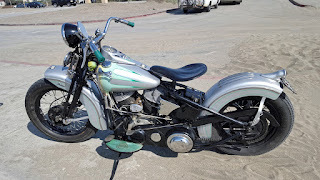 Adding to the excitement, we were riding bikes with poor brakes, foot clutches and hand shifters. That's a lot to coordinate while squeezing between cars! The traffic was relentless and really never let up until we reached Joe's house. By the time we pulled into the garage, both me and the bike were ready for a well deserved break. 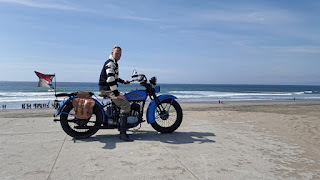 As I look back over the last three weeks, I'd like to tell you about all the times things went wrong and we just got by holding things together with duct tape and bailing wire, but it turns out we never had any issues with either bike. 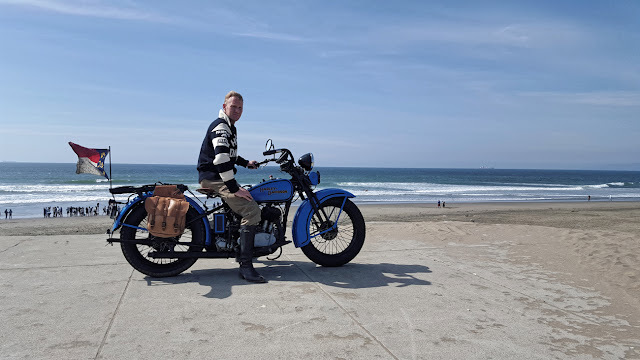 Sure there is a little luck involved with a problem free ride across the country on antique motorcycles, but I like to think it was the intense preparation and careful attention to daily maintenance which kept us running smoothly for over 3600 miles. One thing for sure, these old bikes can still be viable forms of transportation and with time and dedication just about anyone can learn how to keep them running. The round trip from Joe's house to San Francisco logged another 115 miles on the old GPS, putting the total mileage for the trip at 3649.5 miles.